The Southern gothic, supernatural musical “Ghost Brothers of Darkland County,” written by Stephen King, with music by John Mellencamp and T Bone Burnett, is headed to the Morris Performing Arts Center at 7:30 p.m. on Tuesday, Nov. 5. This extraordinary collaboration, 13 years in the making, is a haunting tale of fraternal love, lust, jealousy and revenge, which will be performed by an ensemble cast of 15 actors and a four-piece live band. The album of the musical will be released on June 4. 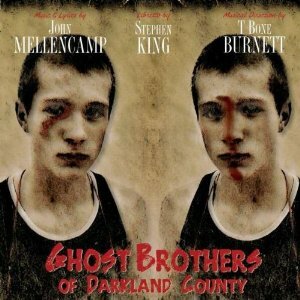 The saga began when Mellencamp told King about a cabin on his land in Indiana where two brothers had gotten in a fight over a girl; one brother accidentally killing the other, only to die along with the girl in a car crash a short time later. King came up with an outline for a play in a matter of days. And then off and on, back and forth, they began to develop it into a full-length musical. Set in the tiny town of Lake Belle Reve, Mississippi, the story centers on two sets of brothers: the ghosts of Jack and Andy, dead in an apparent murder/suicide, and their nephews, the living Frank and Drake, who seem to be headed toward the same downward spiral as their uncles. Joe, younger brother of Jack and Andy, father of Frank and Drake, has decided it’s time to reveal his own terrible secret at the site of the tragedy, before it’s too late. As the story emerged during the writing of the musical, it became clear to the collaborators that the musical’s had taken them into unfamiliar territory — and they liked it that way. Tickets are $69.50 for Pit, Orchestra, Boxes and Mezzanine, $59.50 for Main, 1st and 2nd Balconies and $39.50 for 3rd Balcony.